Users can click "Ask a Question" link on header section of the front end to submit a question or to create a ticket. Your Name: If you are logged in to the knowledge base, this field will display your name. However, for other users, it displays an input field where a user can enter his name. Your Email: If you are logged in to knowledge base Email field will display your email. However, for other users, it displays an input field where a user can enter his email address. 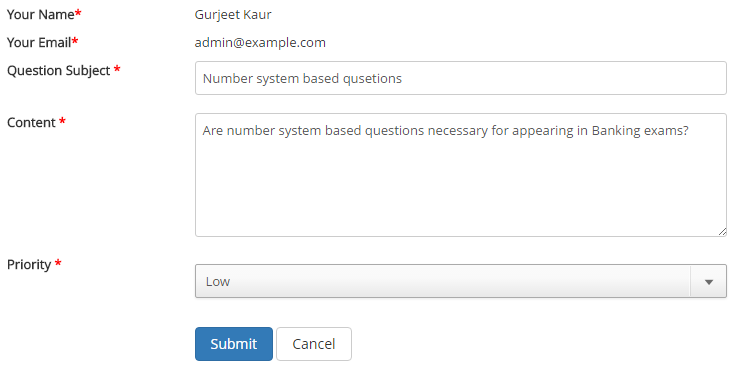 It is required in order to send an email to the user when admin user replies back to a user question. Question Subject: Enter the subject of the question in this field as shown in the figure above. Content: Enter contents of the question in this field as shown in the figure above. PHPKB knowledge base software provides the instant question suggestions facility to users. When a user types the content, the software checks the words and does a full-text search on the existing knowledge base articles. If some matching articles are, the user will get some recommendations in Suggested Articles box above the form as shown in the figure below. Priority: User should set a priority level (Importance of question) from a drop-down list in this field. These priorities are: low, medium, high and urgent. Priority is set so that admin user can identify a level of importance of the question. Click "Submit" button to submit the question or you can click "Cancel" button to abandon the submission process.